You can find Sudokus with a size of 16x16 cells on this page. These Sudoku puzzles are more suited for advanced players. The indicated difficulty level refers to the number of cells that are visible at the beginning, for even the 'easy' 16x16 Sudoku puzzles are quite more demanding than the common 9x9 ones. Whether you prefer to play these large Sudokus with letters or numbers is surely a matter of taste. So you can try both versions here. And the PDF files with letter and number Sudokus have different solutions. If you want to use the MaaTec Sudoku program to create 16x16 Sudokus with numbers yourself, you will need a special font that contains two-digit numbers instead of letters. Please visit the Tutorial pages to learn more. 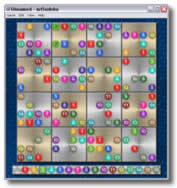 Solution 24 easy Sudoku puzzles with 16x16 cells (30 KB). Solution 24 medium Sudoku puzzles with 16x16 cells (29 KB). Solution 24 easy Sudoku puzzles with 16x16 cells and letters instead of numbers (28 KB). Solution 24 medium Sudoku puzzles with 16x16 cells and letters instead of numbers (27 KB).